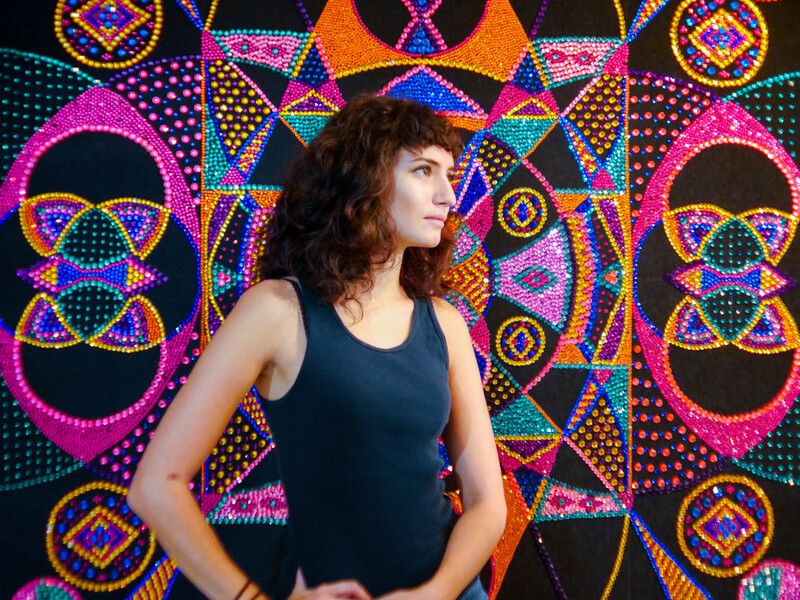 When I met Evie Falci a while ago and she told me that she worked with rhinestones on denim, I knew that we were meant to connect. 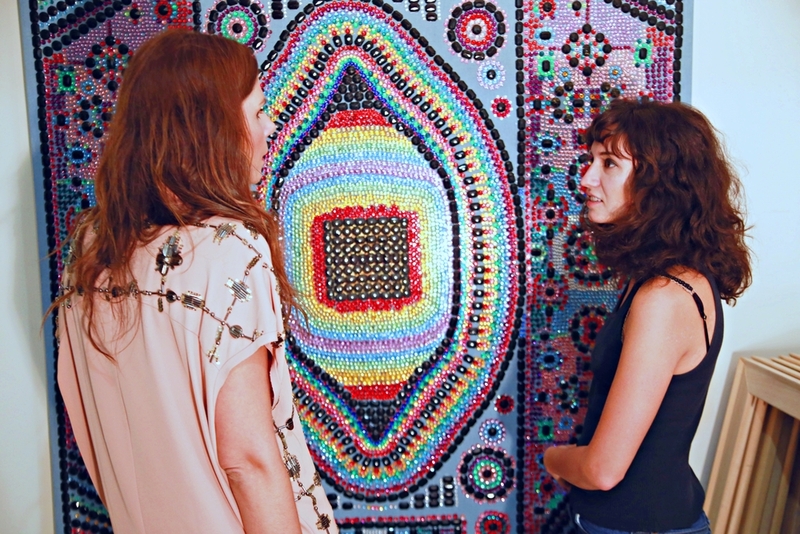 And so we went to visit her in her Brooklyn studio and she gave us a taste of her unparalleled creativity and talent. While in art school, Evie had an epiphany: she was more interested in exploring materials and the formal composition of shapes and patterns than painting or drawing or throwing herself into more traditional media. And so she started studying and researching mandalas, mysticism, Paleolithic art and anything that would support her ideas and their translation into art. The results so far have been phenomenal: using stretched denim or faux leather as her canvas, Evie intuitively starts creating patterns with rhinestones or studs that will give shape to a much larger figure. Without sketching anything beforehand, the ensuing forms are compelling and open to interpretation; they can be deities, religious symbols, people, mythological creatures, you name it. 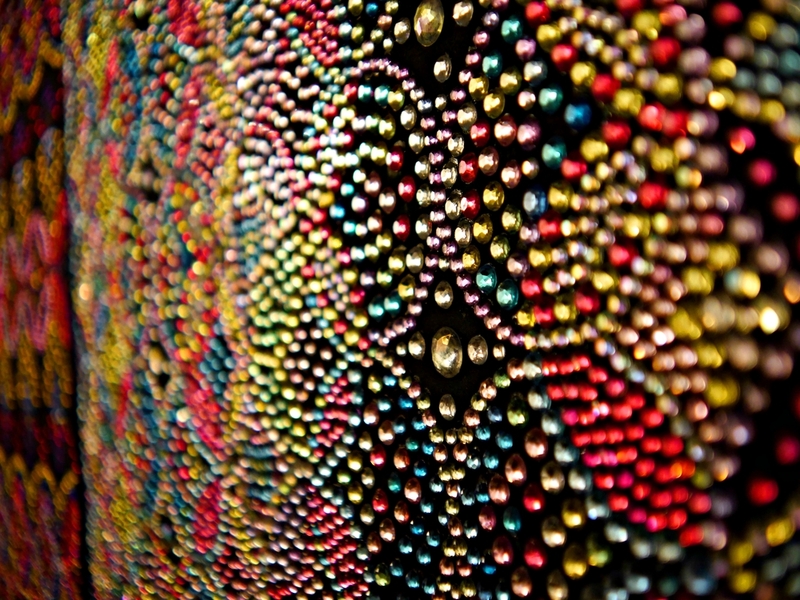 There is something quite magical about Evie’s work: perhaps is the transformation of these rhinestones into massive pieces whose patterns are mesmerizing, well crafted and labor-intensive – yet they leave room for imperfections and become soulful in the process, maybe it’s Evie’s passion for crafts, fabrics, and the elevation of it all to the form of contemporary art. Whatever it is, it’s working for her (and for us, who can appreciate and get lost in the bling of her art). Evie’s work can be seen in a current group show at the newly opened Regina Rex Gallery and an upcoming show at Underdunk in Brooklyn. She is represented by Jeff Bailey Gallery in Hudson, New York.